Story by Lurline McGregor. Photos by PF Bentley. 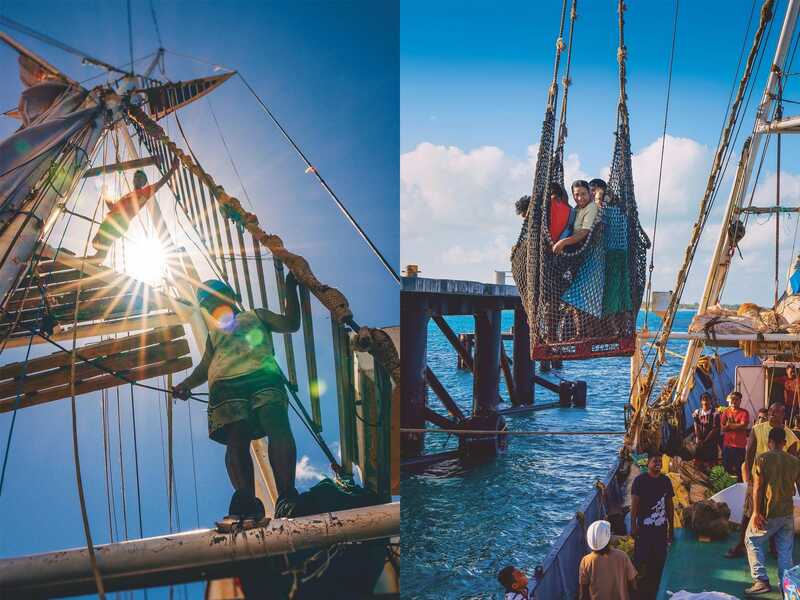 Working in hard hats and bare feet under the blazing sun, the crew of the sailing vessel Kwai spends five days handling cargo at the dock in Kiritimati. Off come pallets of goods purchased at the box stores and thrift shops of Honolulu, and on go barrels of diesel and bags of rice, flour and sugar bound for the remote outer islands. On the third day, the work grinds to a halt when the sun sets and guests arrive carrying the fixings of a feast. It’s party time. Kwai is 140 feet long and can carry the equivalent of ten fifty-foot-long shipping containers, but it’s a shrimp compared with the container ships that the dock at Kiritimati (a.k.a. Christmas Island) was built to accommodate. Standing at the edge of the dock with trays of grilled lobster and breadfruit, the guests peer at the ship in the water twenty feet below. To get aboard they climb into a cargo net and hold on tight while the harbor’s crane operator swings them into the air and lowers them to the vessel’s deck. By sailing whenever possible, Kwai saves fuel and reduces its operating costs. As a sailing cargo ship, Kwai is an unlikely throwback to a pre-container ship era. Yet by serving tiny islands that other cargo ships rarely visit, and by using sail power to slash its fuel costs, Kwai has found a niche in the world of maritime transport. Since 2006 it has plied the waters of the equatorial Pacific offering cargo and passenger services. Four or five times a year, Kwai sails from Honolulu to the Line Islands in the Republic of Kiribati, loaded to its Plimsoll line with merchandise from Costco, Sam’s Club, Walmart and other discount outlets. Kiritimati is its regular first stop before setting off for the more isolated isles of Tabuaeran (Fanning Atoll) and Teraina (Washington Island). 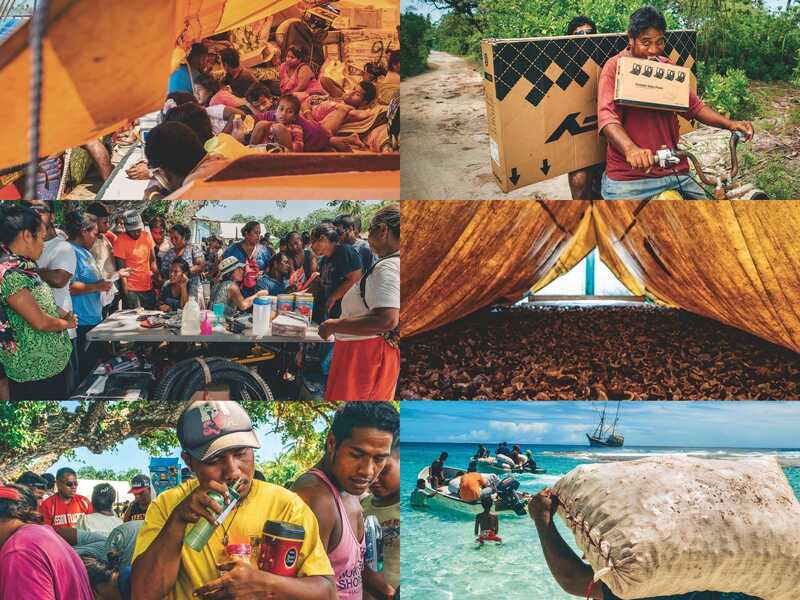 As supply ships from Kiribati’s capital visit Tabuaeran and Teraina just once or twice a year, Kwai has become an important part of the economic and social fabric of these communities. On each of the islands it serves, Kwai has a business agent, and it’s the agent on Kiritimati who has organized the evening’s feast. He brings with him a troupe of young dancers, who perform traditional dances of the I-Kiribati, as the people of Kiribati call themselves, set to a techno beat. Adorned in fragrant head lei, the I-Kiribati deckhands and stevedores sing and dance along with them. Ives is pulled to his feet to join in the final dance. Then he graciously but firmly lets his guests know it’s time to get back in the cargo net and go home. There are still two days of cargo loading ahead, and everyone needs their sleep. The ship’s senior captain and owner, Brad Ives (seen here traveling back to Kwai), comes from a long line of New England sea captains. Ives bought the ship in 2002, rescuing it from the scrapyard. When the last of the cargo is loaded, the crew closes the hatch, covers it with rugs and stretches a large awning over the deck for shade and rain protection. Thirty-eight passengers, carrying large stalks of bananas and other luggage, board via cargo net, then spread woven mats over the rugs and settle in for the thirty- to forty-hour trip to Tabuaeran. Kwai has room for about fifty passengers, and it often sails at capacity. Sports teams, medical personnel, members of parliament, policemen, prisoners, councils of elders, construction crews, businessmen, kinfolk en route to or from months-long family reunions—all sorts of people book passage on the boat, which costs half the price of a ticket on Air Kiribati. In the Northern Cooks, Kwai once delivered the entire population of the island of Nassau—eighty-six men, women and children (plus two ducks and one pig)—to the island of Puka Puka for the nation’s Independence Day celebration. While the passengers are supposed to remain on the main deck during the passage, in the evening many somehow find their way to the aft deck, which is reserved for the crew. The informal concerts are inevitable, with passengers and crew playing ‘ukulele and singing in harmonies that sometimes move the heart and other times send everyone into gales of laughter. With all the passengers aboard, Ives blasts the ship’s horn, the crew casts off and the five-hundred-mile round-trip voyage to Tabuaeran and Teraina gets under way. But as Kwai motors toward open water, Ives notices puffs of white smoke emanating from the stack. As diesel emissions are supposed to be clear, this means the engine has a problem. Neither Ives nor the engineer can figure out what’s wrong, so a quarter-mile from shore Ives turns the boat around and returns to the dock.“Better safe than sorry,” he says. Built in Germany in 1950, Kwai was originally named Bayern, then renamed after the 1957 war film Bridge on the River Kwai. Ives comes from a long line of New England sea captains and counts himself among the descendants of Nathaniel Bowditch, the nineteenth-century mathematician considered the father of modern navigation. As a youth he spent his summers sailing small boats on Maine’s Penobscot Bay. At age 20 he “ran away to sea” aboard the Sophia, a three-masted, group-owned sailing ship—“a floating commune,” he calls it. “The idea was to fix it up in six months and sail around the world in two years, then go back to college. After two years we were still fixing it up, and it took eight years to finally sail around the world.” To make ends meet Sophia sometimes carried cargo, and so began Ives’ career in maritime trade. In the late 1970s Ives bought and refurbished Edna, a 1916-built Danish schooner, and launched an international cargo company. Sailing from New England to South America, with stops in the West Indies and occasional journeys to Africa, he dealt mostly in building materials, such as bricks from New Bedford and tropical hardwoods from Surinam. When he wasn’t plying the seas like the ocean traders of old, he worked as a boat builder, commercial fisherman and captain or crew member on other people’s boats. Kwai has room for about fifty passengers, and it often sails at capacity. Passage on the boat costs half the price of a ticket on Air Kiribati. Ives bought the boat in 2002 and began the painstaking process of rehabilitating it and converting it into a full-fledged sailing ship. After four years of restoration and refitting, he sailed Kwai to Surinam, loaded it with silver bali lumber and set off for Hawai‘i to sell the cargo. Along the way he stopped in Rarotonga, where he registered the vessel and ended up acquiring a shipping license allowing him to import goods to the Cook Islands. When government officials in the nearby Line Islands caught wind of the Kwai, they invited Ives to apply for a license to work there, too. Back at the dock in Kiritimati, Ives and the engineer are unable to pinpoint the problem causing the white smoke. By radio Ives’ diesel guru in Honolulu deems the engine sound enough for the out-and-back to Tabuaeran and Teraina, as long as it’s not run too hard. The next day the harbor’s crane operator swings the passengers, who spent the night ashore, back on board, and Kwai gets under way once again. With a top sustained sailing speed of ten knots, Kwai doesn’t travel as nearly as fast as motorized cargo ships do, but its reduced diesel consumption allows it to serve island communities that wouldn’t be profitable for fuel-reliant cargo carriers. Ives is always looking for skilled people “with just the right amount of weird” to fill the ship’s senior crew positions. On this voyage a self-described “boat jockey” from Alaska serves as engineer; a Dutch woman who left a forestry career to go to sea serves as first mate; and a marine biologist from Hawai‘i taking a break from environmental consulting serves as super-cargo, the manager of the cargo and its sale. On some voyages Kwai employs a relief captain, allowing Ives to spend at least part of the year with his wife at their small farm on the flank of Hawai‘i’s Kīlauea volcano. While Ives has gotten years of service from some loyal and talented crew members, there’s always turnover in these positions. The deckhands are a more unchanging group. Many of the thirty or so I-Kiribati men on Ives’ roster of local help have sailed with Kwai since the beginning. Some are second-generation hands. Jobs are hard to come by in the Line Islands, and crewing on Kwai is a prestigious gig. On this trip Ives has brought on eight deckhands and a few extra stevedores. In addition, two I-Kiribati women serve as cooks. Working wonders with an apartment-size four-burner stove and ingredients that might include a twenty-pound bag of rice and a seventy-pound tuna, the cooks keep all aboard well fed. After an uneventful thirty-hour passage, Kwai enters the light blue lagoon at Tabuaeran. Before the crew has finished tying the boat to an offshore buoy, the Tabuaerans are in skiffs headed out to greet them. There is no dock here, so the passengers ride to shore in the skiffs. Then Kwai’s boom and winch are rigged, and the unloading of cargo into the skiffs begins. Mountains of staples loaded at Kiritimati and special orders from Honolulu spring up on the beach while the supercargo hunches over his paperwork beneath a tree, overseeing the fulfillment of orders. A few trucks arrive to carry off goods, but it’s mostly motorcycles and bicycles that are used to whisk away the 110-pound bags of flour and flat-screen TVs. Bicycles, bike parts and bike tire patch kits are popular items from Hawai‘i, as are instant noodles, canned juice, canned meat and fish, bottled water and disposable diapers. Kwai also carries nine-hundred-pound bales of clothing from the Salvation Army. If you see someone in the Line Islands wearing a t-shirt with Punahou Girls Volleyball or Lanikai Canoe Club printed on it, chances are it came from a bale. Tabuaeran and Teraina only recently got internet service, and now laptop and tablet computers are hot items. On this trip Kwai has brought more than three hundred Amazon Fire tablets. All of them were ordered by residents of Tabuaeran and Teraina, which have a combined population of around three thousand. I-Kiribati dancers perform for the crew at Kiritimati (Christmas Island). This is Kwai’s forty-fourth voyage since it began its Pacific cargo service, and I flew to Kiritimati to join the ship for the trip around the Line Islands. On Tabuaeran, Ives dispatches me to inform a longtime customer, Bruno de Lala, that the freezer he sent off for repair is back and needs to be picked up. Thin and tanned, Bruno is a seventy-something Frenchman whose sailboat ran aground here a few decades ago. Despite the islanders’ attempts to send him on his way, Bruno settled down, married a local woman, had two daughters and opened La Belle Etoile, a rustic bed and breakfast that caters to the trickle of fly fishermen and surfers who visit the island each year. It’s there, among the thatched-roof guest cottages, that I find him. When I tell him his freezer is back, he says, “What freezer?” It has been more than a year since he sent the broken appliance away, and he has since replaced it with a new one. There is no end to the setbacks, surprises and complications that arise when Kwai is making its rounds. Sails tear, unforecast storms develop, orders are lost, copra bugs invade the crew’s bunks. Once Kwai came upon an abandoned yacht adrift in the deep blue, compelling it to drop what it was doing and tow the vessel to port. Another time a fifty-ton crane toppled onto Kwai’s deck, causing extensive damage (but no serious injuries) that took days to repair. Whatever the situation—whether it’s a leaking toilet or a leak in the aging hull—Ives’ unflappable mien invariably signals “we can fix this.” Sometimes, though, there’s nothing to be done but drive the boat and hope for the best. Such was the case when a seasick passenger, attended by two other seasick passengers, gave birth on deck. (The healthy baby boy was named Kwai.) Bruno declining the return of his freezer is a faint hiccup, and one that’s quickly forgotten after a Tabuaeran store owner decides he will take the thing instead. Captain Ives loading goods from Honolulu before departing to Kiritibati. After three days on Tabuaeran, the passengers bound for Teraina reboard, Ives blows the ship’s horn and Kwai heads back out to sea, still trailing little puffs of white smoke. The following morning we drop anchor off Teraina. There is no sheltered lagoon here, let alone a dock, just a hole blasted through the fringing reef for small boats to get in and out. In rough seas unloading tests the expertise of Kwai’s crew and the island’s boatmen. But on this trip the waters are calm, and both passengers and cargo are moved easily ashore. Over two days the crew discharges one hundred cubic meters of cargo and reloads forty tons of copra. Ives’ wife, April Fountain, runs Kwai’s business operation from Hawai‘i, taking orders and overseeing the shoppers who scour Honolulu’s retail outlets for the best deals. Above, pallets of cargo ready for loading. Kwai’s arrival is always a spectacle that brings out the community. Even the disembarked passengers remain on the beach to watch the activity. As on Tabuaeran, a single sand road connects the villages that ring the island. Each village has a maneaba, or open-air meetinghouse, surrounded by raised houses fashioned from coconut fronds, pandanus leaves and tin sheeting. Many have solar panels and a few electric lights. The satellite dish for the internet is planted outside the island’s council house. During the day two computers are available there for a modest fee. After hours the wi-fi is turned on, and anyone can sit outside and connect. This has made the council house the new gathering spot in the evening, where islanders sit messaging friends in faraway places and shopping on Amazon for things Kwai will eventually deliver. Ives’ wife, April Fountain, working from her home office on Hawai‘i Island, runs Kwai’s business operation, taking orders and overseeing the shoppers who scour Honolulu’s retail outlets for the best deals. Every day at 7:30 p.m., when Kwai is out in the world plying its trade, she gets on the shortwave radio to talk with Ives. When there’s drama to report, it usually flows from ship to shore. But on this trip, as Kwai returns to Kiritimati, Fountain is the one with the bad news. It’s May 2018, and one mile above Ives and Fountain’s farm, the ground has cracked open and lava has come pouring out. Civil authorities are evacuating the neighborhood. Loose items, like the tires seen here, are secured with plastic wrap for the voyage ahead. If Ives is freaked out, he doesn’t let on. But when we get back to Kiritimati, he hops the first flight for Honolulu. Over the next two weeks, more volcanic vents will open up above and below the house, issuing lava and clouds of sulfur dioxide. Ives and Fountain make a few trips to the property to remove the office files and some furniture before lava destroys the home. “Every-thing we didn’t grab and toss into the truck is gone,” Ives says.